Felice Arena is a popular author in our library! Felice has a range of fans across the grades for his series books including Specky Magee, Farticus Maximus, Stick Dudes and Andy Roid. You can find Felice’s website HERE. Felice has just released a new series called Sporty Kids that is perfect for early readers. The first sports are Swimming and Footy with more sports to follow. The books are a perfect length with short chapters and fun illustrations by Tom Jellett. 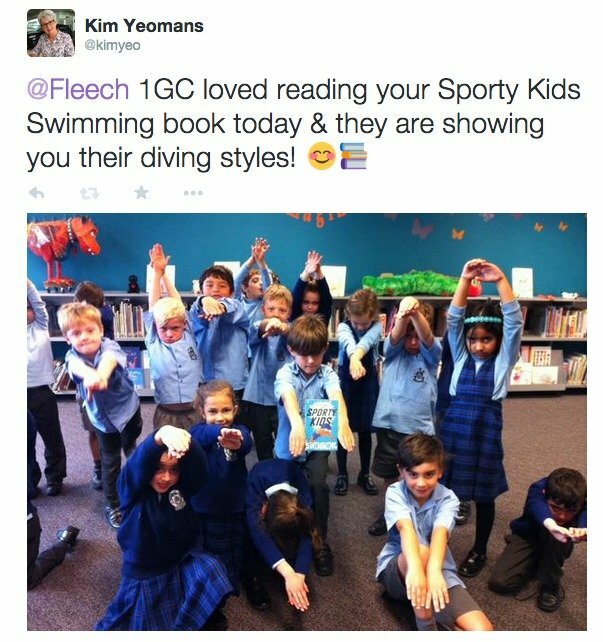 Miss Y thought the Year Ones would really enjoy the Sporty Kids books and she wasn’t wrong! We read the Swimming book and had lots of fun talking about belly- whackers (and demonstrating them!). Lots of students have had swimming lessons and knew the activities that Emma and her friends were doing. They liked that some of the characters shared names with children in their classes. They loved the way Emma used her imagination to help her with her swimming and had lots of fun guessing which sea creatures she would pretend to be and were very accurate with their guesses! Some classes even cheered Emma on as she tried her last dive. 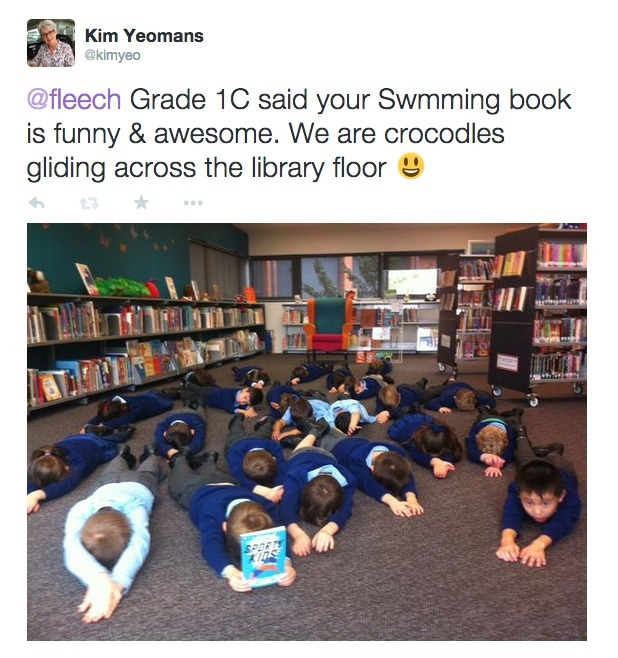 A big part of the fun was when Miss Y took photos of each class pretending to be one of the sea creatures and tweeted the photo and our comment to Felice. It was so exciting to have Felice send a tweet back to each class! Tweeting with Felice was a fabulous way to connect the students directly and immediately with the author of the book they were reading and to “take the book off the page”! They were thrilled to read Felice’s replies. It was tricky fitting everything into our 45 minute lesson (and Miss Y had a few typos while trying to speed type on her phone) but it was well worth the effort. This entry was posted in Uncategorized and tagged Felice Arena, Reading, Swimming, Twitter by smotlrcblog. Bookmark the permalink. Thank you Miss Y for engaging Yr 1 students in a global and meaningful way. I can imagine the excitement when the tweets came through. What a wonderful author to engage with each class. Thank you Miss Y for all that you do to keep connecting to make reading real and engaging at St Martin’s. As you know, it’s very important to me that reading is fun and engaging in our LRC. Twitter has given me the opportunity to connect with many wonderful authors and it was fantastic that Felice tweeted with our students. There was such a buzz of excitement! Thank you for having a look around the blog. I’m glad you like the changes. I like our new header with the brightly coloured books and I think they match “We read…what’s your superpower?” really well. Change is a good thing! I didn’t know that Raj was actually a real person either! I wonder if being in David Walliams’ books has made both Raj and his shop famous? 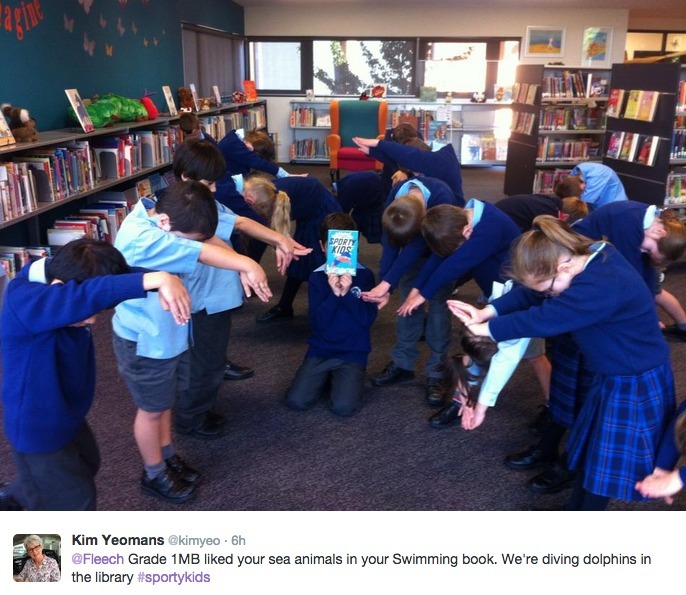 I love the photos of 1MB being dolphins! 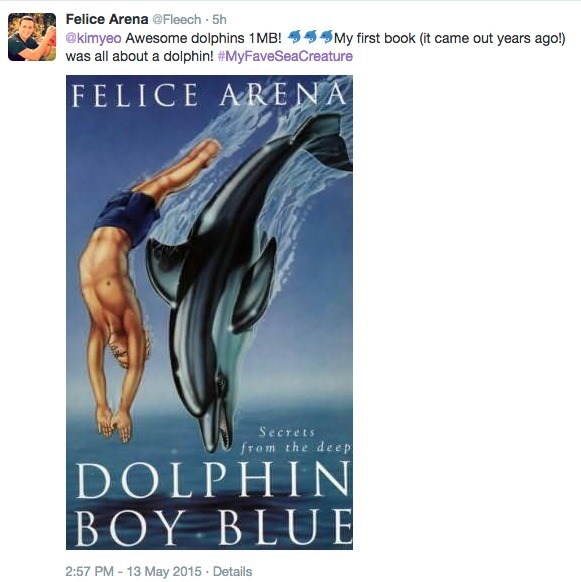 I MB had fun being dolphins and were very excited when Felice Arena tweeted back to them!